I seem to be getting a lot of ghost stories to review this time..... No complains there though... Presenting Delia's Shadow by Jaime Lee Moyer. Historical fiction - Ghost Story - Thriller - A Subtle Romance. Makes for a nice and complete blend of the story of Delia's Shadow. Centered on the post 1906 San Francisco Earthquake and resulting fires. This is the story of Delia Martin, who had been able to see ghosts as a result or shall I claim as a gift of the quake. Quite literally this is a murder mystery, with the ghost story playing an integral part of it. And while the majority of the ghosts may not bother her, except for one. This one christened, "Shadow" by Delia, as she doesn't seem to be able to communicate in words but that of dreams. Terrible haunting snippets of Shadow's last breath as she becomes the prey of a ('the') serial killer. Shadow wants justice and for that Delia returns to San Francisco to help solve that mystery. Reunited with her best friend Saddie and her mother Esther and meeting her (Saddie's) fiancee, Jack and striking a bond with his partner, Gabe. Delia maybe actually closer to solving the mystery that is "Shadow" but her killer is no angel. He is vicious, cunning and ruthless...... and knows how to play the situation in his favor. He has npw set his sinister eyes on the Pan- Pacific International Exhibition - and time is of the essence if they are to prevent more gory acts from this monster. Told in the narratives of Delia & Gabe as the two story lines intertwine. The romance is subtle and not overpowering enough to keep room free for the paranormal and murder mystery part of the tale to play out, a plus for me. As the era depicted, the chemistry and romance feel very real and apt. Delia, quite the kind and soft-spoken but a determined person and Gabe, the stalwart detective but closed off. It is interesting how Gabe & Delia feel an attraction towards one another, enough for him to actually be able to let his emotions show.... And the grisly details of the murder are chilling and exciting enough to keep us tethered to our seats. Full of unexpected twists and turns, the chilling ghostly visits and the gory mystery encompassing a much appreciated eye for details in general, Jaime Lee Moyer has done a marvelous job at connecting the various sub-genres and finally producing a concrete and a solid tale. 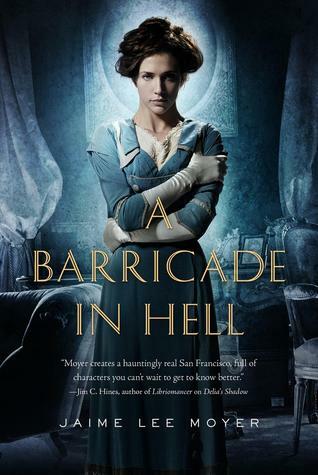 Unputdownable and engaging.... and if her goodreads author bio is to be believed, two more books are being planned in this series - "A Barricade in Hell" and "Against A Brightening Sky" ..... so i'm definitely keeping my eyes open for these..... while I urge you guys to try it out, this is worth the money. "Engaging & Unputdownable..... Highly recommended"
I agree it was a really interesting book, I didn't know if we could have a second book, so I'm happy it's the case. 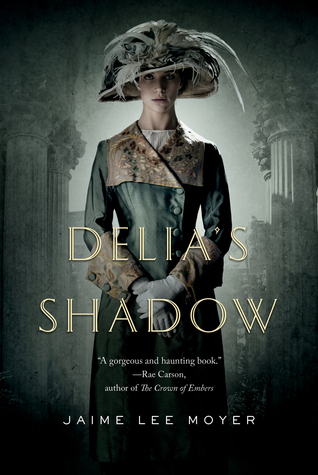 Ohh, I can't wait to read Delia's Shadow! I'll have to add it to my TBR list! Yep, will look out for the next two. I'm in agreement. Such a good blend of genres!